Roger Stone speaks to the media after appearing before the House intelligence committee in a closed-door hearing on September 26, 2017, in Washington, D.C.
A federal judge is deciding whether to permit a lawsuit to go forward in which Democrats allege that Donald Trump's campaign colluded with Russian government's cyberattacks on the 2016 presidential election. The parties appeared in federal court in Washington, D.C., on Thursday. The three plaintiffs are represented by Protect Democracy, a watchdog group made up primarily of former Obama administration lawyers. Two of the plaintiffs, Eric Schoenberg and Roy Cockrum, had their Social Security numbers dumped online by WikiLeaks; a third plaintiff, former Democratic National Committee staffer Scott Comer, said that his sexual orientation and personal medical details were publicized due to the leak of private emails. The defendants are the Trump campaign generally and one ally specifically: Trump confidant Roger Stone. Their attorneys denied they were involved with any conspiracy tied to the Russian attack on the 2016 election. If Judge Ellen Segal Huvelle lets the lawsuit proceed, it would move into the discovery phase — setting up an avenue that could compel the Trump campaign and Stone to provide information separate from the investigations into Russian election interference being conducted by the Justice Department and Congress. Fourteen former national security officials have submitted a brief as part of the lawsuit, a highly unusual development that occurred prior to the hearing on Thursday. The amicus brief — which was filed by officials including former CIA Director John Brennan, former Director of National Intelligence James Clapper and former National Security Agency Director Michael Hayden — did not endorse the arguments of the plaintiffs nor the defendants, but sought to establish that the Russian government generally seeks to use local actors to amplify its influence operations, including its interference in the 2016 election. The hearing on Thursday afternoon was largely procedural. The judge considered whether or not to dismiss the case entirely. Huvelle largely focused on dense legal questions about the proper court to hear the lawsuit and the contours of the alleged conspiracy. Huvelle expressed skepticism about whether the lawsuit shouldn't have been filed in New York, where the Trump campaign had been headquartered, and also raised questions about the scope of the alleged conspiracy, including when it supposedly concluded. Attorneys for the Trump campaign argued that it never hacked, possessed or disseminated the DNC emails, while Stone's lawyer Robert Buschel said that to be part of the alleged conspiracy Stone needed to know about the hacking and dissemination — which Stone denied. 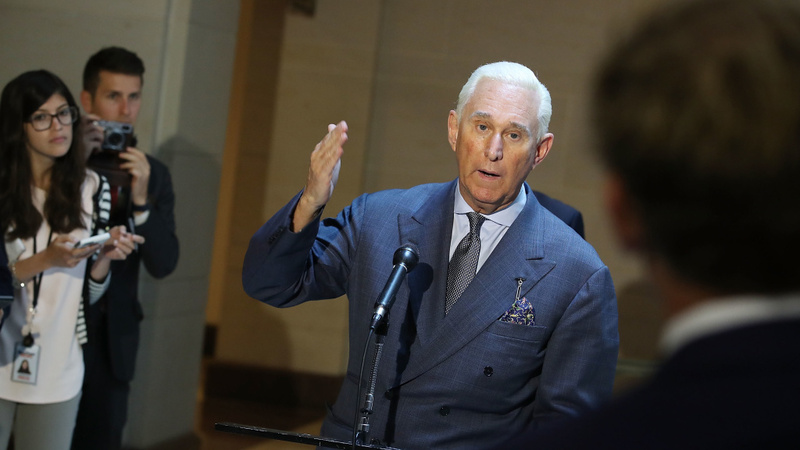 Although Stone did suggest on Twitter in 2016 before the fact that he was aware of planned releases by WikiLeaks, which allegedly fenced emails stolen by Russian intelligence operatives and released them into the public domain, Stone denies he had any detailed awareness or involvement. The degree to which people in the Trump world were aware or involved came up at least once in court: Trump campaign lawyer Michael Carvin at one point argued that if the campaign truly wanted to intimidate Democratic donors by leaking Social Security numbers, they would have done it in a different way. The campaign wasn't going to get very far with that logic, Huvelle said, as she characterized Carvin's argument as: "If we were going to do this crime, we would have done it better." At another point, the judge demanded emails that showed the harm the former DNC staffer allegedly suffered. "Gotta see the emails," she said, before adding, "Don't want them all dumped on me either. I'm not WikiLeaks."